Okay, so an app that reminds you to take your prescriptions is not the most exciting one in the book, we’ll give you that—but boy is it useful! RxmindMe is a rather simple app that exists solely to help you remind yourself of which pills you need to take and keep track of stocks, so that you can replenish them when they are running low. Given its utilitarian nature, you won’t find any UI flourishes in RxmindMe, but it gives you all the features that matter without complicating the interface. 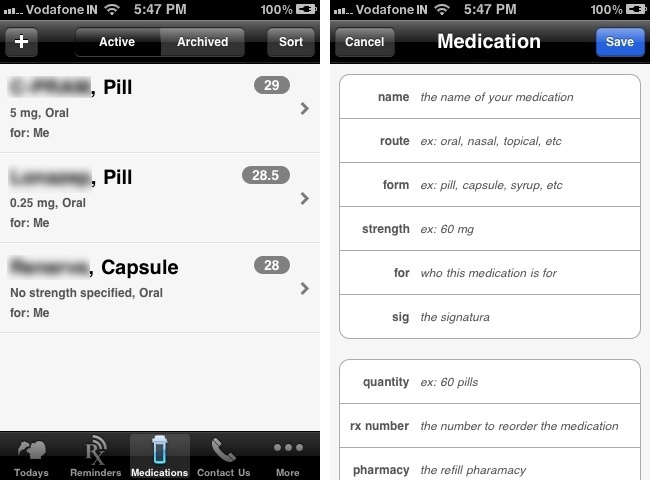 The app is primarily divided into three tabs—Todays [sic], Reminders and Medications. Let’s go through the functions of each. Under Medications, you can add the drugs that have been prescribed by your doctor. The app lets you specify the name, method of intake, form and strength of the medicine, all of which is going to come in handy should you need to purchase it again and cannot find your prescription. It also lets you specify if it is for you or someone else among your contacts—so you can, for instance, use the app to keep track of your kids’ meds as well. What’s even cooler is that you can specify how many (or much) of the meds you have in stock and enter its rx number, your pharmacy and prescribing doctor. You can then set up a reorder alert to have the app remind you to do some restocking when the amount left falls below a certain limit specified by you. Other options include adding notes about medicines and saving a picture of them. All of the above is optional, however, because the app works even without any medications added to its database. When you go over to the second tab, you can set up nine different kinds of reminders: hourly, daily, weekly, monthly, on specific dates, as needed, every x number of days and for birth control. On the next screen, you need to enter a name for the reminder and, based on its type, at what times it will fire and when it should end. If you went through the slight trouble of entering in your medicines into the app’s database earlier, you can (optionally) choose on this screen which ones that reminder is for and what quantities are to be taken each time the reminder is fired. Later, when you mark a course as taken, the app will subtract the quantity accordingly, thus tying it all together. That is the core of the app and it works excellently. I’ve been using it to remind me to take my meds every morning and evening and it throws up a notification at the right times for me every day using local notifications on the iPhone (so it does not need an Internet connection to function and can do so in the background). When I take the meds, I launch the app and mark them as taken. There are several other features too: you can mark a course as skipped should you forget to take your meds despite RxmindMe’s reminder, search for medicines in the built-in FDA drug database so that you do not have to enter the details manually and export your prescription history in the form of an email or a CSV file that can be opened in Apple’s Numbers or Microsoft Excel. 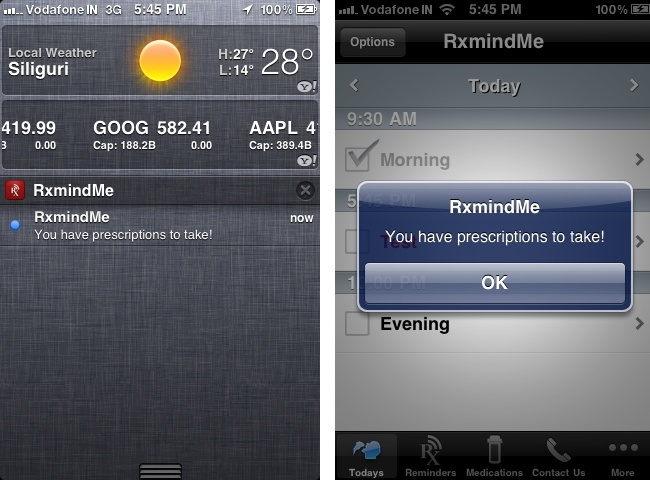 RxmindMe also lets you turn off certain reminders temporarily if you want to and it keeps your past medicines in a locally stored archive for easy retrieval later. It is also secure, what with the local storage of data and the option to set up a passcode to prevent wandering eyes from taking a look at your prescriptions. Given all that it does and how well it functions, we were surprised to discover that the app is free of charge and contains no advertising either. 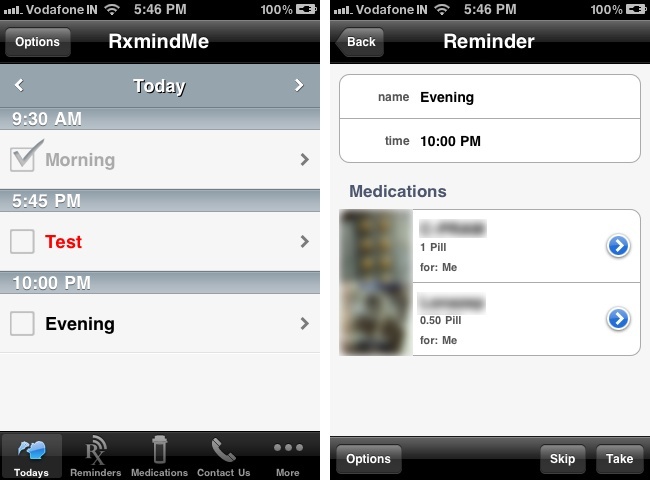 If you’re on a prescription and find yourself forgetting to take your meds, RxmindMe is just a small download away on the App Store.